This week our family had a little scare with our labrador retreiver and our wonderful neighbors were so helpful with the situation! 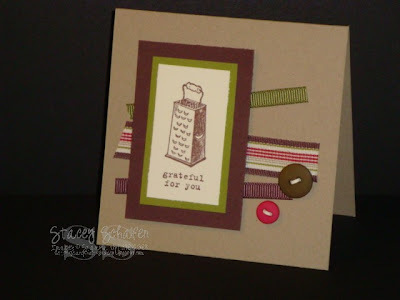 I'm sending this card to them to express our gratitude! I love this stamp set, Puns from the Past, from the catalog sampler so much. It reminds me of my Great-Grandmother and of many childhood memories. I especially remember helping her in the kitchen with the old-fashioned grater! I really love your card! It is so cute. Congrats on both awards...you so deserve it. I am hoping to participate in your jewelry challenge next week. This is fabulous! I love this set and really like the layout! Simple, clean and fun!